Laxmi is the Goddess of Wealth. However, true wealth is the abundance of love in our lives. 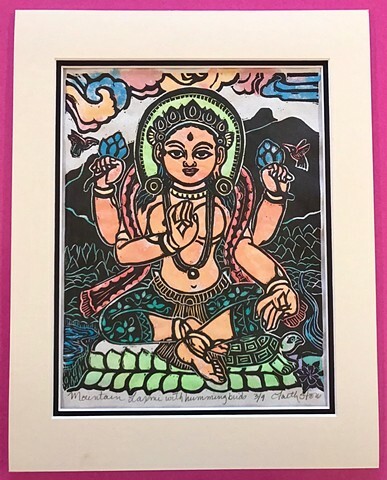 Here she is depicted at Shoshoni yoga retreat with Little Bear Mountain in the background and attended by two hummingbirds. Mokuhanga is the traditional Japanese style of woodblock prints. Typically a separate block is hand carved for each color used. The blocks are printed onto Japanese Kozo or mulberry paper by hand rubbing with a barren. The inks used are sumie and watercolor inks. Mokuhanga is a labor-intensive old school printmaking practice.